TikTok, the world's fastest growing short-form video app, has announced the three category winners of its 1 Million Audition in Malaysia. Held from 15 to 24 September, diverse and talented creators across the country joined the hotly contested race to be crowned the most talented TikTok creators in Malaysia. Over 52,000 videos were submitted by Malaysians for a chance to increase their followers, win rewards and be on the path to become the next Internet sensations. Each winner receives RM5,000 and also wins a trip to the TikTok Gala in Seoul, South Korea in November to meet and celebrate with other creators from the app’s global community. The 1 Million Audition in Malaysia comes hot on the heels of the Big Stage, a reality singing competition broadcast on satellite television which saw contestants dubbed Budak Baru Nak Up (Kids About to Be Popular) compete LIVE on stage for eight weeks. The final stage held recently saw Sarah Suhairi being crowned as the grand winner. TikTok was the official and only audience voting platform during the competition that contributed to the contestant’s final score. 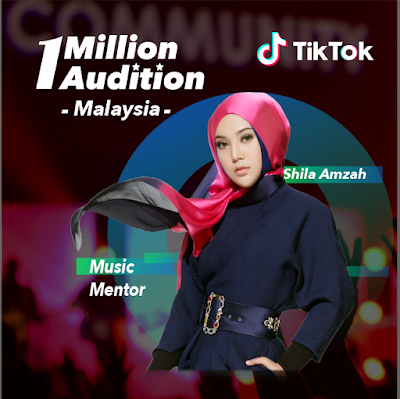 The 1 Million Audition is a creator discovery program initiated by TikTok to discover and incubate new talent from the platform by providing budding creators with a platform to showcase their diverse talents and gain followers and rewards at the same time. The first global online short video creator contest, 1 Million Audition has been successfully held across India, the United States, Latin America, Europe, South Korea, Thailand, the Philippines, Indonesia, and Vietnam with over one million participants. As a global community across 150 countries and regions around the world, TikTok is used by millions of users daily to express themselves through singing, dancing, art, and more. In addition to hundreds of millions of user-generated videos, the platform has attracted major artists, launched social media influencers, and featured original content from some of the largest entertainment companies.